General location: Whalers Bay, Deception Island, South Shetland Islands. 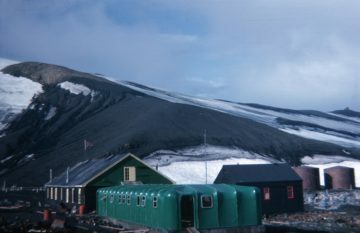 The station was evacuated temporarily on 5 Dec 1967 after volcanic eruptions. It was evacuated again on 21 Feb 1969 when further eruptions damaged the station buildings. On both occasions personnel were evacuated by the Chilean ship Piloto Pardo. The station was finally abandoned on 23 Feb 1969 after personnel had returned to collect personal possessions. Meteorology and geology. Centre for aircraft operations 1955–1957 and 1959–1969. Originally buildings from the former Norwegian Aktieselskabet Hektor whaling station were used. These included Bleak House, a former dormitory which was converted into the main accommodation and office building. It was destroyed by fire on 8 Sep 1946. Another former dormitory from the whaling station was then used as the main accommodation building and became known as Biscoe House after John Biscoe, Master, Royal Navy, who discovered Graham Land in 1832. The Magistrate’s Villa, the name reflecting its previous use, was used as a store. A new hut known as the FIDASE hut or Hunting Lodge was erected on 13 Dec 1955. 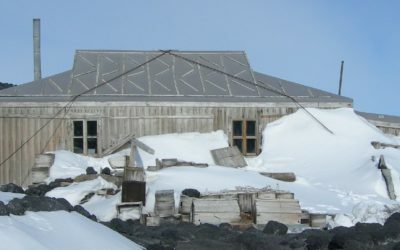 It was used by members of the Falkland Islands Dependencies Aerial Survey Expedition, 1955-57, employed by Hunting Aerosurveys Ltd. On completion of the survey this hut became the property of FIDS. An aircraft hangar was completed in Mar 1962. 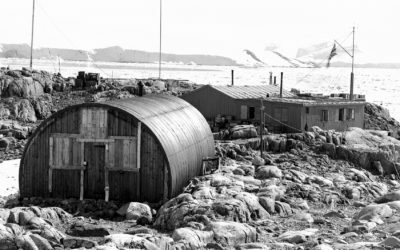 A plastic accommodation building known as Priestley House after Sir Raymond Priestley, Acting Director of FIDS 1955-59 and geologist on Scott’s expedition 1910-13, was erected in Jan 1966 and found to be missing (sic) on 22 Mar 1985 when RRS John Biscoe visited. A graveyard was established and used mainly during the whaling era. It was destroyed by mudflows during volcanic eruptions. One member of FIDS was buried there. The site of the cemetery is marked by a plaque. A H Farrant, 17 Nov 1953: grave. Closed. Site cleaned up by BAS in 1990/91 and 1991/92. 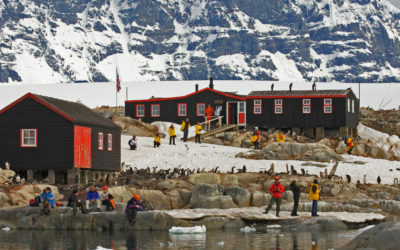 The remains of the Norwegian whaling station were designated as Historic Site No. 71 under the Antarctic Treaty, 19 May 1995. The fuselage of BAS single Otter aircraft VP-FAI(K) was removed from the site in Apr 2004 and has been in storage in the UK under a Memorandum of Understanding since May 2005. Deception Island was adopted as an Antarctic Specially Managed Area at Antarctic Treaty Consultative Meeting XXVIII (Stockholm, 2005). Inspected for BAS by a conservation architect in Jan 2007.